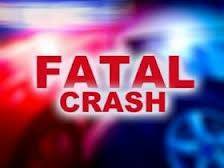 MARION — A 29-year-old Marion man died in a single-car crash in Morrow County on Tuesday evening. The Morrow County post of the Ohio Highway Patrol is investigating the 7:45 p.m. crash on Ohio 746, west of U.S. 42 in Westfield Township. Tony M. Fraley, 29 , of Marion , Ohio was eastbound on Ohio 746 in a 1994 Ford F250. According to troopers, Fraley drove off the left side of the road and struck a tree. He was transported to Morrow County Hospital in Mount Gilead where he died due to his injuries. Fraley was wearing his safety belt at the time of the crash, troopers said. Troopers were assisted at the scene by the Cardington Fire Department, Elm Valley Fire Department, Morrow County EMS and Delaware County EMS. The crash remains under investigation by the Mount Gilead post.